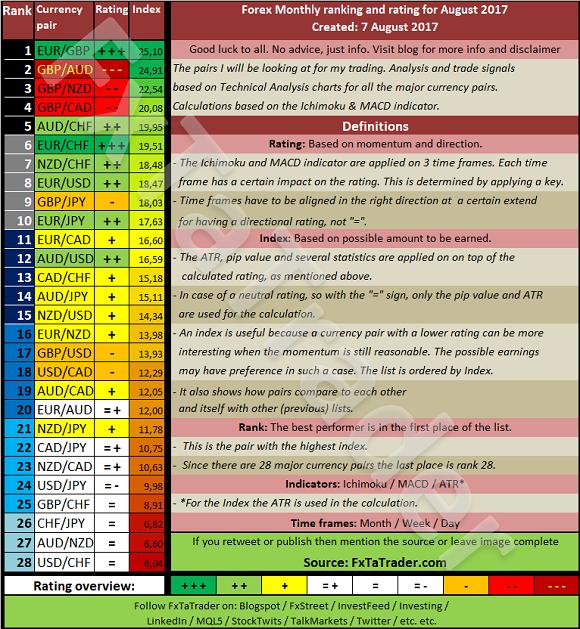 The Top 10 of the Ranking and Rating list for the coming month shows the following stronger currencies being well represented for going long: the EUR(4X) followed by the AUD(2X) with the NZD(2X). The weaker currencies are the GBP(5X) followed by the CHF(3X). The Chart for this month is the AUD/USD Weekly chart. Price is above the Tenkan-Sen and clearly in an uptrend, the pair made a high with a fractal a few weeks ago and may consolidate in the coming period a few more weeks before continuing the uptrend. The PSAR is looking fine for taking long positions and the MACD is also confirming this. A nice buy opportunity would be on pullback below the Kijun-Sen. There is a yellow dotted line at 0.7730 and that seems to be more or less the middle of the area (+/- 40 pips) where the fractals are. This is a good support area for that reason and also because it is near the Kijun-Sen which is a good support also. The MACD should go by preference around the signal line and once it gets stronger it may become interesting to look for an entry. Strength can be seen in the minus Signal (blue and red bars). A safe and realistic profit level would be below the last top. That is also where a fractal was made around the price of 0.8065. The Daily chart may offer good information for the entry price. There is a range of +/- 250 Pips between the entry discussed in point 1 and the profit level discussed in point 3. 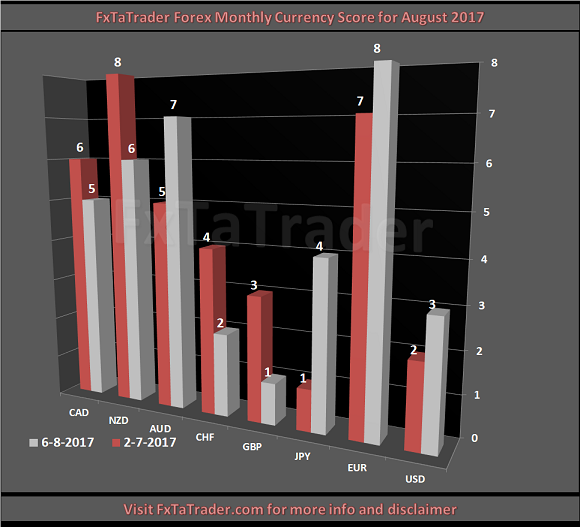 The AUD is a Neutral currency and the USD a Strong currency, the Currency Score Difference is +4.